On Thursday, April 29, 2016, as required by the Washington State Environmental Policy Act (SEPA), the Washington Department of Ecology and Cowlitz County, Washington released a draft environmental impact statement (EIS) on the huge Millennium Bulk Terminals coal export terminal proposed for Longview, Washington [1, 2]. Along with the U.S. Army Corps of Engineers, which is preparing a separate federal draft EIS, the agencies are studying the potential environmental and social impacts and evaluating the risks of this project . They will review and consider all concerned citizen input after the 45-day comment period ends on June 13, while performing further analyses for the final EIS. Once this document emerges, terminal owners would begin application processes for local, state, and federal permits. Millennium proponent Lighthouse Resources (formerly Ambre Energy) owns 62 percent of the project; 38 percent owner Arch Coal has filed for bankruptcy. Their potentially largest such facility in North America, built and operated on the site of the former Reynolds Aluminum smelter, could annually transfer and stockpile 44 million metric tons of Powder River Basin coal, strip-mined in Montana and Wyoming, between unit coal trains and ships bound for Asia. Besides eight empty, returning trains daily, the terminal would impose on trackside communities eight fully loaded, additional coal trains per day. This last remaining Northwest coal export project of an original six proposals should concern Idahoans, who live among relatively clean air and water, abundant wildlife, and scenic beauty, just as much as Washington citizens . 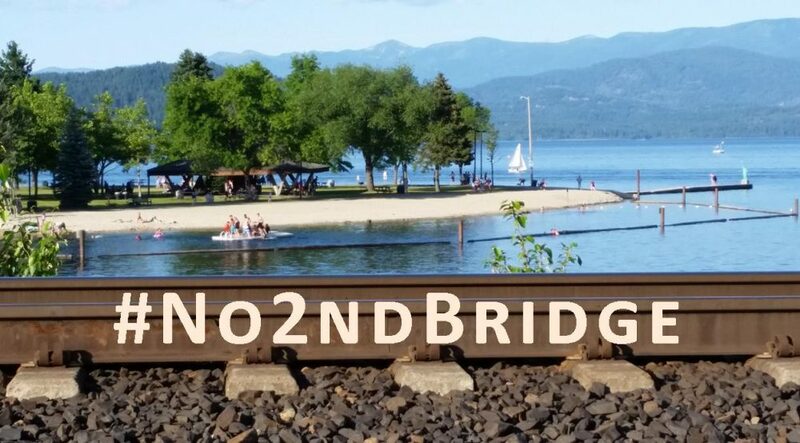 Coal transport through Sandpoint and surrounding north Idaho communities, 400-plus miles away, directly pollutes, threatens, and impacts regional public and environmental health and safety and economic vitality, all for private profit. Each coal train engine spews carcinogenic diesel fumes, and its 110 open rail cars together shed 55,000 pounds of coal dust from mine to port, laden with arsenic, lead, mercury, nickel, tin, and other heavy metals. Health experts link exposure to diesel exhaust and coal dust with decreased lung capacity and exacerbated asthma, bronchitis, emphysema, pneumonia, lung cancer, and heart disease. Increased, slow-moving coal traffic can also obstruct and delay vehicles at rail crossings, extend the travel times of emergency responders, and block access to hospitals, schools, businesses, and neighborhoods. Heavy coal trains damage rails with their pressure and clog the pores of gravel under tracks, reducing wet ballast permeability and stability and thus risking derailment of other hazardous and explosive freight. Why support the significantly faltering coal industry and world markets [5, 6]? In recent months, owners of a dozen of the most productive coal mines in the Powder River Basin and country, Peabody, Arch, and Alpha Natural Resources, have filed for bankruptcy . With the downturn in Wyoming coal, oil, and gas production, 2,400 dirty energy sector employees have lost jobs since January 1, most from the two largest coal companies . Burlington Northern Santa Fe Railway has furloughed 4,600 workers nationwide over the last several months, and Union Pacific Railroad has laid off 4,100 employees. After 30-plus years of endlessly fighting coal projects, tribal and Montana activists have stopped the Otter Creek coal mine in the Powder River Basin, and the federal Surface Transportation Board has dismissed the permit for the Tongue River Railroad . Agencies temporarily suspended EIS preparation for the Gateway Pacific Terminal at Cherry Point near Bellingham, before the Lummi Nation and supportive Northwest tribes convinced the U.S. Army Corps of Engineers to reject permits for the once biggest proposed coal port in North America, in defense of their Constitutionally-protected treaty rights to fishing grounds and practices . And these developments represent only the most salient of recent, historic Northwest victories over extreme energy projects. But the Washington Department of Ecology has announced three informational open houses and public hearings on the proposed Longview coal terminal draft EIS in three cities across the state. Various organizers with the Power Past Coal and Stand Up To Oil coalitions are hosting 4 pm rallies at each location, before oral testimony restarts after 5 pm agency presentations (also at 1 pm). Please read the draft EIS on the Department of Ecology’s website, wear red, and come prepared to speak for only two minutes and/or provide comments to a court reporter and/or in written form during the meeting. Although Wild Idaho Rising Tide (WIRT) is not a coal or oil coalition member organization, campaign partners have thanked us and small Idaho and Montana groups for our deep commitment, extraordinary efforts, and superlative support of Washington comrades on the anti-coal issue, and have asked us to encourage and mobilize Idahoans to attend the June 2 Pasco hearing. WIRT and Spokane allies can attest, based on our experiences of the October 2013 scoping hearing for this coal port, that we greatly need more red-shirted coal opponents to speak out at this likely industry-heavy event. Our region-wide, several-dozen turnout last time generated much grassroots networking, local media coverage, and public awareness [14, 15]. WIRT activists are unaccustomed to, and have little faith in, working within the regulatory framework (hearings, comments, etc.) as these processes play out in reactionary Idaho, although such political organizing appears to work in more progressive states like Oregon and Washington, which have thwarted at least 15 fossil fuel infrastructure projects. We usually just take to the streets, tracks, extraction sites, offices, etc., because that is typically our only, lonely recourse in Idaho. Through government/industry dog-and-pony shows and standard-format conservation campaigns, we have seen way too much power diverted from the grassroots frontlines over the last five years. Nonetheless, please consider RSVPing, inviting your family and friends, attending, speaking, and impressing government agencies deliberating the Millennium Bulk Terminals draft EIS at upcoming hearings, especially in Pasco on Thursday, June 2! Despite Idaho’s almost non-existent participation in Break Free Pacific Northwest actions, we are again organizing carpools and possibly renting a van, with transportation funds offered by the coalition. Please contact WIRT soon with your questions about contributing input and filling volunteer roles at the Pasco hearing: We will do everything we can to get you there! These hearing and comment period opportunities may provide the Northwest community’s last chance to tell the coal industry and colluded government that our public and environmental health are too important to risk. Let’s keep coal in the ground, put the last nail in the coal train coffin, and exceed record numbers of past fossil fuel infrastructure comments (the Tesoro-Savage oil terminal draft EIS prompted 289,000 comments)! If you cannot come to one or more of these convergences, please send your written feedback on the draft environmental review to agency decision-makers by mail or online before the June 13 deadline [1, 2]. Please share the honor of your presence in coal resistance. We gratefully and eagerly anticipate seeing and hearing from you at these hearings. Thanks!